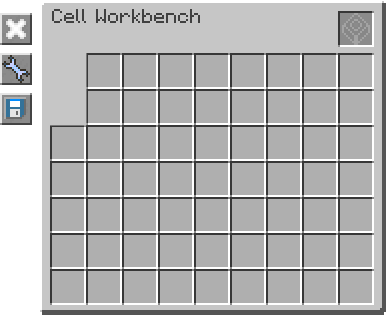 The Cell Workbench is a block added by the Applied Energistics 2 mod and as the ME Preformatter (formely known as the ME Partition Editor) by the Applied Energistics mod. It allows players to rename and format an ME Storage Cell to specify the items' data it will store. Formatting is used for storage efficiency as the Cell uses additional space to store data about each item type in memory, having multiple small cells storing large amount of a few item types means more storage than using one large cell of the same capacity storing various quantities of several item types; for example: 1,024 bytes of storage can hold 127 stacks of a single item. or 65 stacks of 63 different item types. A cell's formatting may be changed at any time. The Workbench is not part of the ME Network and does not require energy to function. Clear: clears the grid of previous ghost items. Partition Storage: formats the cell using the current contents. Copy Mode: Controls if the contents of the configuration pane are cleared when the cell is removed. This page was last modified on 19 May 2016, at 14:16.